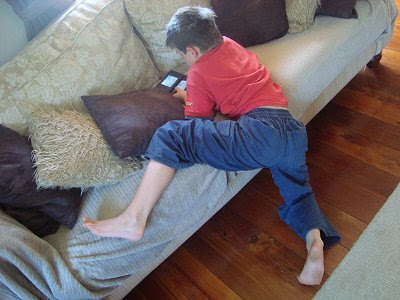 Yep, my son (Master 8) is a Nintendo DS addict... checkout the strange positions we have found him in during the last week! 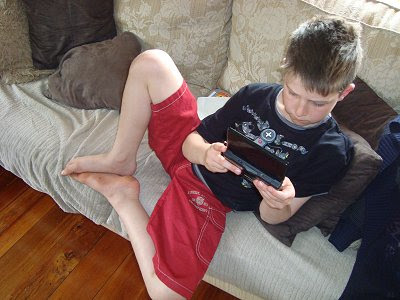 Because of this 'passion' for technology, we had to set firm boundaries a few years ago, which included only playing on the computer and DS during the weekends and holidays. He is really good at playing games... and really white because he needs to get out in the sun more (he proudly told me the other day that he's the whitest boy in his class!)... and he's also very flexible (as you can see in the photos). I love my flexible, computer nerd son so much. Maybe I should take up DS playing to improve my flexibility? Ha thats so cute..guess all that pent up energy has to come out somehow! I've got a boy who love technology and his DS too! Yip we have a 7 year old DS lover in our house too.. He convinced me into letting him play DS for 5 minutes instead of me reading him his bedtime story.. Miss 4 would like a pink one for her birthday.. But I myself do personally like them as they seem to keep my kids quiet and I can actually get things done around the house! 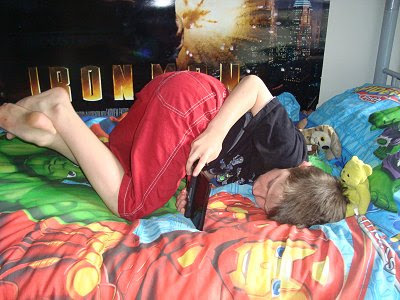 Mr 7 also can get his body in various weird positions while playing the DS, its hilarious! is he 'flexible' about turning it off when you tell him to? I'm most present if he is!! over here it's the XBox. the boys get together every friday and usually play until 3-4am! So funny!! My 5-yr old son always sits like the 2nd picture when he's doing stuff. I'm like "either get on the sofa or sit on the floor" and he says "why can't I do both?" He has a point I guess. It's the middle of winter...don't worry about him being pale. Now, if he looked like that in the summer, I'd strongly suggest a quick dose of Vitamin D! so stinking funny. he should try to take his DS playing to the outdoors and work on his tan!